As much as possible, we want to provide all our children to have their own single bed. However, if the room space that we have in our home is limited and could not accommodate it, then bunk beds are the best option to have. It is indeed a great space saver but it also comes with great risks most especially in the aspect of safety. 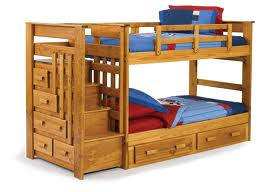 There have been incidents of fall, strangulation, head injuries and a whole lot more related to bunk bed utilization. The one sleeping on top of the bed would most likely experience it. If you decide to buy one, be extra cautious. Keenly inspect how it has been made, its sturdiness and the quality of materials used before purchasing. Children under 6 years old shouldn’t be allowed to sleep on the top bunk, according to the recorded bed accidents little kids are the major victims of bunk bed injuries. Make sure that the double bed is located at the corner of the room so that two of its sides have walls. It is also a must for it to have guard rails. See to it that the guard rail is at least 5 inches above the mattress. In addition, provide night lights near the ladder going to the top bunk so that going up and down at night won’t be difficult. You should also warn your children to avoid hanging belts, ropes and similar objects on it, as they make cause strangulation of some sort.